Even though the cost per GB is dropping, there is no need to waste space when there is a simple solution to maximize utilization of it. Thin provisioning provides this solution by allocating physical space in smaller pieces rather than allocating and dedicating the entire volume at provisioning time. The volume presented appears to be the full provisioned capacity to the application servers, but nothing has been allocated until write operations occur. This not only delivers 3x better storage utilization but also eases system administration because there is no penalty for presenting large volumes to the application servers on day one. Thin provisioning is inherent in virtual disk pools. Simply create a virtual volume from a disk pool, present it to the application servers and SANsymphony does the rest. 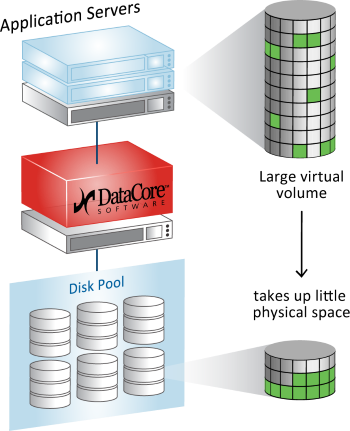 Disk pools span all physical devices in the pool, and are not dependent on any host, operating system, or server hypervisor. Thin provisioning provides outstanding storage utilization efficiency by writing data to the backend disks only when data is written by the applications. This results in 3x better storage utilization. Talk with a storage expert to learn how DataCore can help improve storage utilization across your data center infrastructure.